May 31st 2004. “A crowd cheers as FALLUJA, Iraq (Reuters) – A crowd of cheering Iraqis dragged charred and mutilated bodies through the streets of the town of Falluja Wednesday after an ambush on two vehicles that witnesses said killed at least three foreigners. But really, what makes someone an activist? Does it really come out of “idealism”? I came across Plum’s novel when she read at one of Marissa Johnson-Valenzuela‘s salons, and frankly, her activists are not idealistic. They’re angry, frustrated, driven crazy by the way that horrible things are being done in their name half a world away in while their own lives continue. 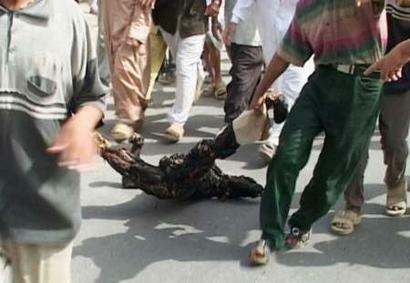 The title comes out of an image shown around the world– a man’s body dragged through the streets of Falluja. Plum’s prologue opens with a news-clip about an explosion in a townhouse, the title of which was borrowed from a 1970 New York Times article about the outcome of the work of a group of another group of activists– soon to become the Weather Underground— who were driven crazy by the war in Vietnam. Photo from the SNCC newspaper The Student Voice most likely taken during Freedom Day in Mississippi in March 1963. Waveland is also a novel about frustration. 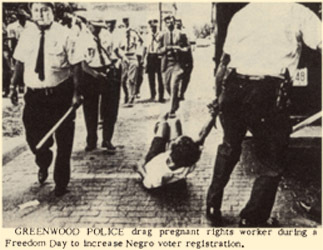 My central character, Beth Fine has seen images of people in Mississippi being dragged through the streets– just like the one I posted here. But if the men and women in Plum’s novel want to bring the war home, the young men and women– mostly white– who went down to Mississippi during Freedom Summer are closer to the activists of the ’80s who went to Central America to counter US policy, or American and Israeli Jews who go to Palestine to rebuild demolished homes. They want to be foot-soldiers in that war, and to use their privileged position to call attention to a crisis. It’s exciting to be reading with Plum. I think our work connects in countless ways, but most certainly on the level of how we respond to brutality done in our name.